Two weeks already passed since I came back from Lisbon. It was 6-days trip only (and two of them were flights), but I think I had enough experiences for a month - I really had everything in this small journey! I was very excited toward masterclass and workshop I was invited to give. Teaching isn't my main activity, I do it from time to time on special occasions, and every time it's a new adventure.I'd shared on my blog the post about the masterclass and separate post with some of Lisbon sketches. Freedom Revolution Workshop, the workshop I was invited to give, was planed to the last day of my stay. 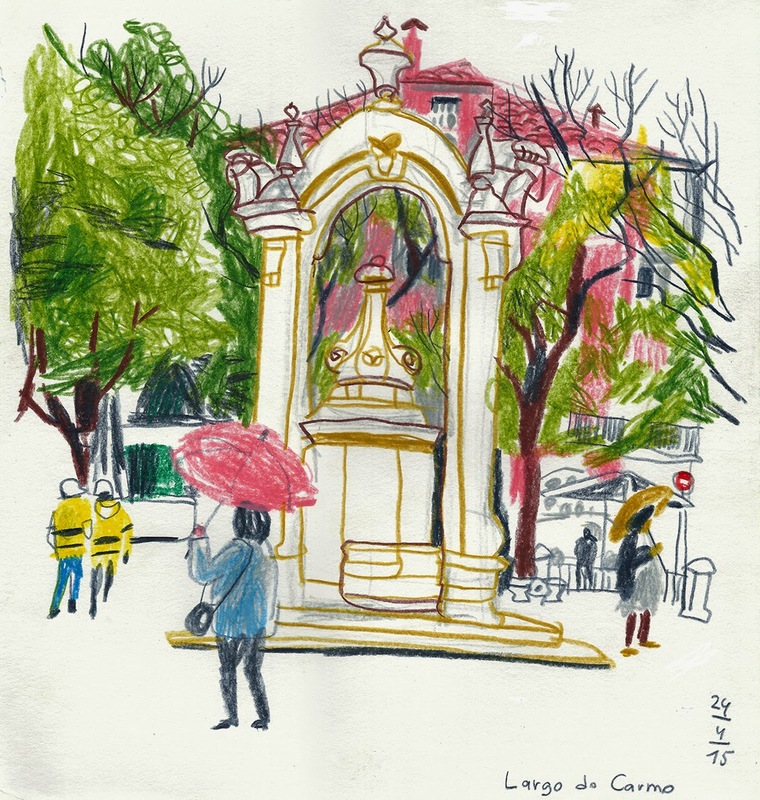 Our meeting point was at the charming Largo do Carmo - small beautiful square, which I had a chance to sketch a day before. The weather wasn't perfect - cloudy and rainy. But of course it couldn't stop our group of enthusiastic sketchers to gather and to enjoy the day. 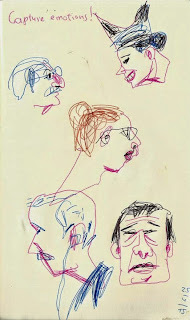 After the short acquaintance round, when each one introduced himself and told in a few words why he loves sketching, we dived into our people-sketching-without-fear workshop. The first exercise called "Capture Emotion! ", and its purpose was to learn to look around us, find characters with interesting facial expressions, and capture emotions in expressive and fearless way. Some sketchers started to swim immediately, as fishes in the sea, others were needed some time to warm up, but all of them had fun and were very brave! Rain become stronger, and we moved to the covered Rossio Train Station and started with our second exercise - "Capture Action!". As you can guess, this time we focused on body language and on capturing action. 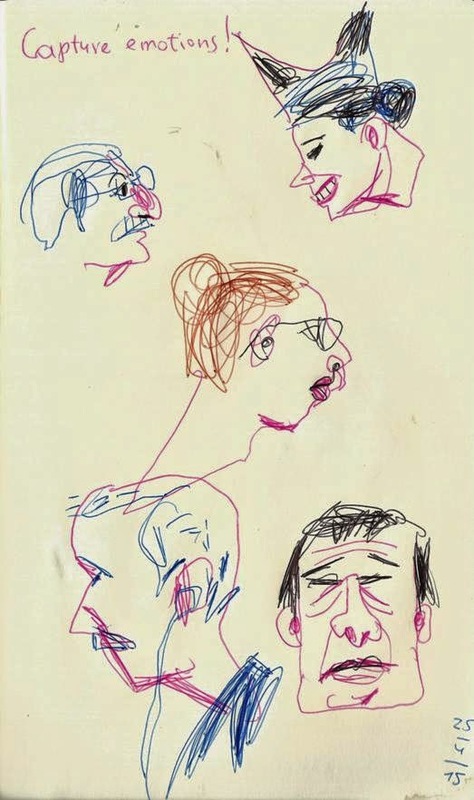 Drawing people in motion is one of the most difficult missions for the sketcher. There are no tricks or magic tools to get this skill, except practice and training our visual memory and our eye-hand coordination. All you need is to be brave, to start and not to afraid to do a lot of "bad" drawings. Flower vendors were selling everywhere red carnations - the symbol of the Portuguese Revolution, which was celebrated at this day. Our group probably got some of revolutionary spirit and sketched fearlessly people in action. 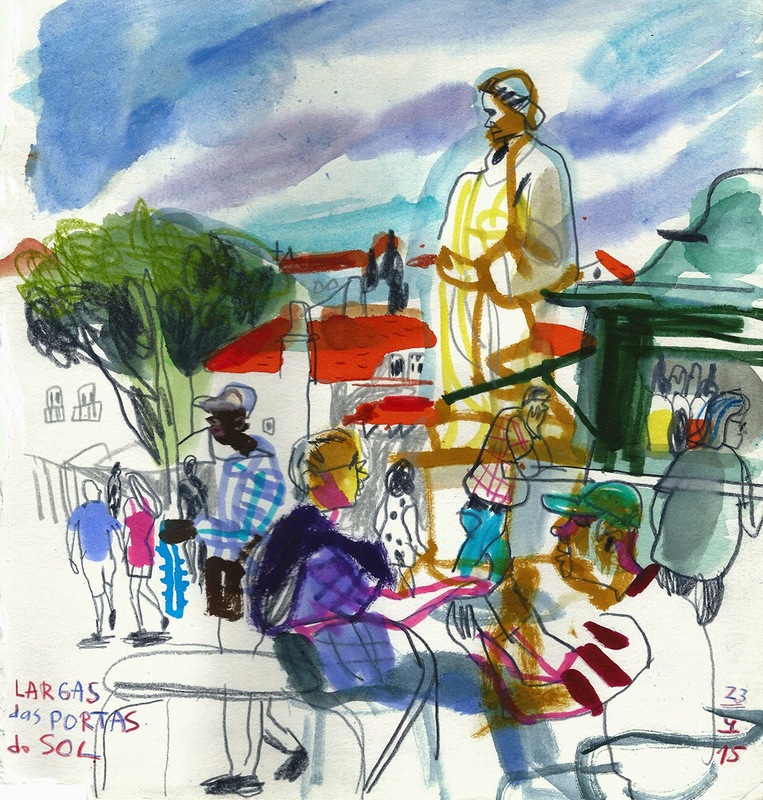 After a 3-hour sketching session we had a lunch break (which included some sketching again ;)), and arrived to the our final sketching point - Praça do Comércio, well-burned in my memory since the final Sketchcrawl of the Lisbon USk Symposium took place there. 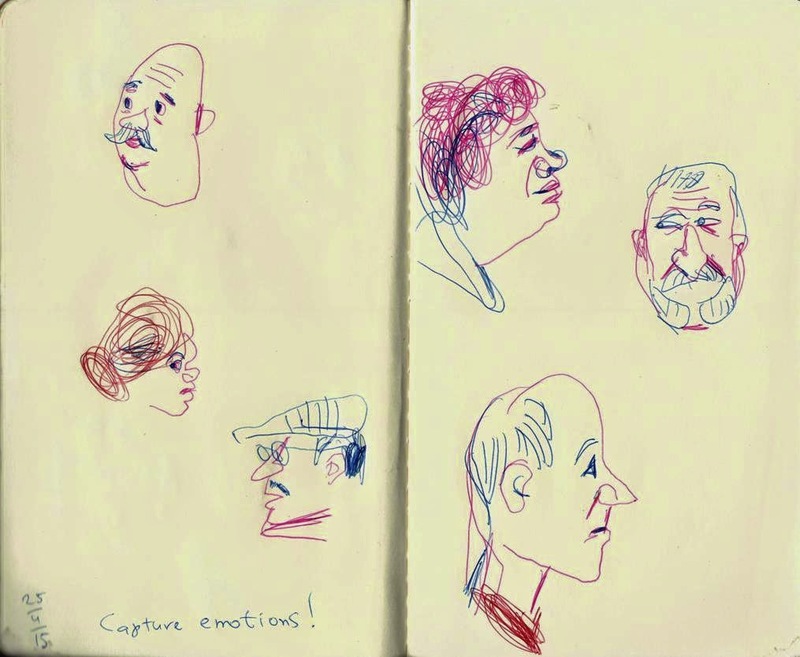 Now, when we were warmed up, and had practiced sketching people in action and describing their emotions through their expressions and body language, we were ready to put them in their surroundings. So, in the final exercise sketchers asked to put their "heroes" into the scene. Everybody spread out looking for the interesting stories. 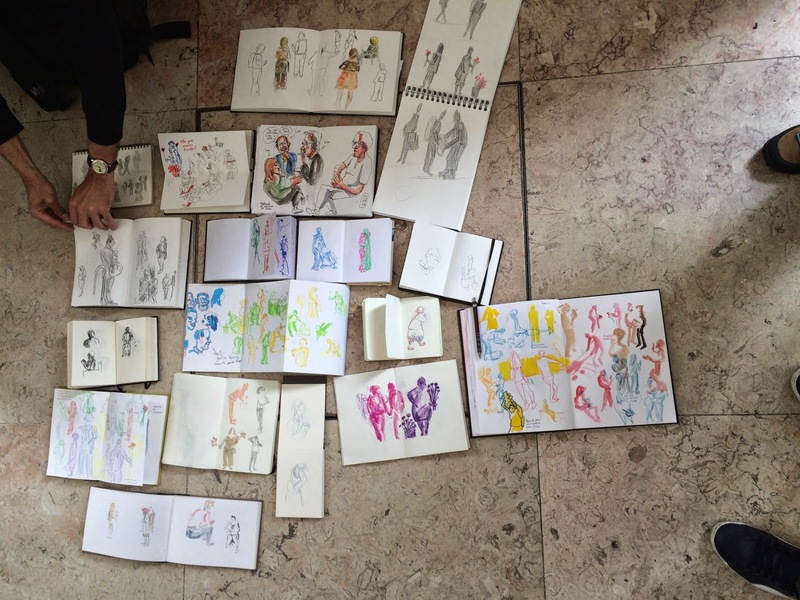 Here are the stories from the square, every sketch tells different narrative, from different point of view and with different mood, and that's all the story about urban sketching for me! It was wonderful experience with amazing, enthusiastic and talented group of sketchers, I enjoyed a lot and also absorbed a lot - no doubt that teaching is the best way to learn! I want to thank again my Portuguese hosts - Mário Linhares, José Louro and Ketta Linhares, for inviting me. 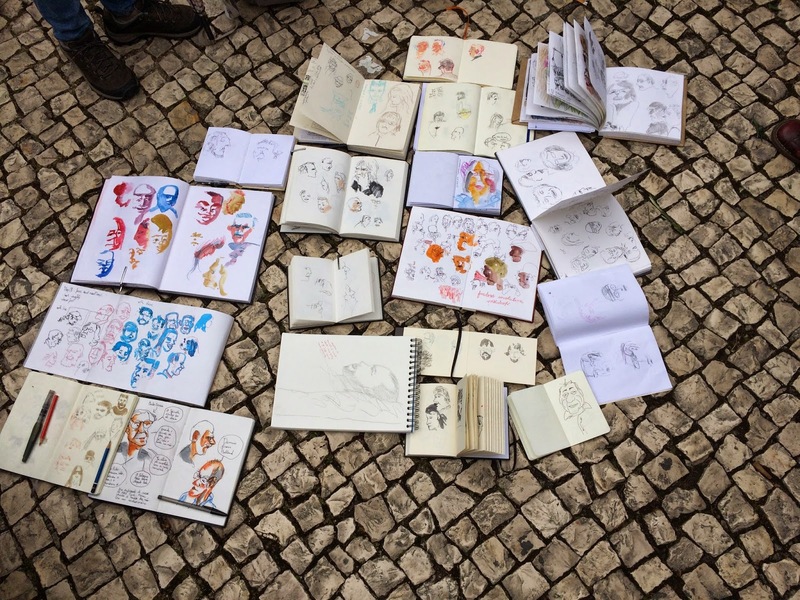 I have to say that I felt a bit envy of Lisbon USk branch - they have a wonderful group of so many talented sketchers and educators, leading the huge group of sketch-lovers from Lisbon and not only. It was a pleasure to meet in person! Here are posts by some of the participants: by Mário Linhares part 1 and part 2, by Pedro Loureiro, by Paula Cabral. It was a wonderful sketch-trip, Lisbon will be always in my heart (and in my sketchbook ;)). 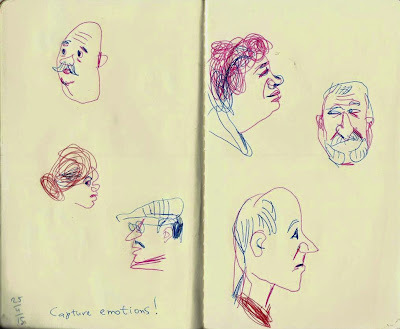 Here are some sketches I did on my free days, you can see the entire Lisbon sketchbook on Flickr. Now, when the Lisbon trip is over, I'm looking forward to the Singapore USk Symposium, where I'll be teaching together with my friend and fellow sketcher Ea Ejersbo this workshop in a bit different format. See you there!! !